A delicious recipe perfect for any occasion! Categories: Chinese celebrations, Chinese New Year, Chinese recipes, recipes | Tags: cantonese, Chinese, Chinese New Year, cook, Cooking, food, Hong Kong, how to make, ingredients, lumpias., Recipe, spring roll pastry, Spring Rolls | Permalink. If any of you have been to a Chinese restaurant, you have most likely seen this Wonton dish. It’s delicious! Often it is served in the form of a soup, with some vegetables and or noodles also in the broth. There are many ways to cook wonton, and there are also many fillings you can use. Here, I will show you my favourite fillings, and I choose these because of the flavours and texture sensations you get. Categories: "How To" Tutorials, Asian Recipes, Chinese celebrations, Chinese New Year, Chinese recipes, Pastry recipes, recipes, Soups | Tags: cantonese, Chinese, Chinese New Year, Cooking, Hong Kong, how to make, ingredients, lovefoodies, pastry, recipes, soup, wonton | Permalink. 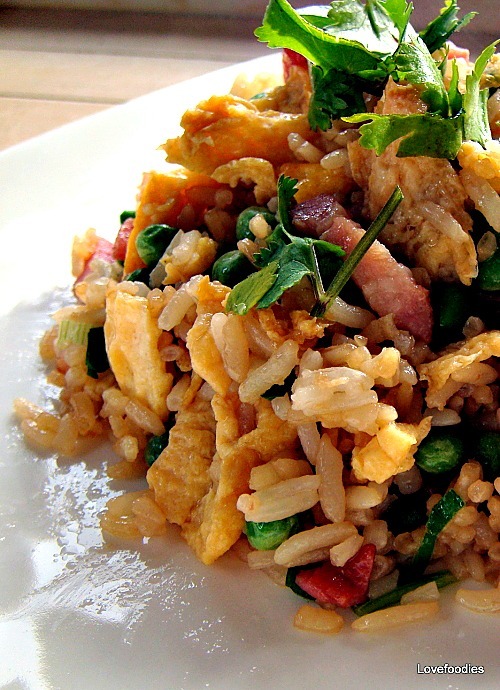 Ever wondered how to make Fried Rice like in the restaurants? There’s no magic to it, you just need to know what the flavours are yes? Here I will show you! Speedy Ham & Egg Fried Rice. Categories: Asian Recipes, Chinese New Year, Chinese recipes, Main meals, recipes | Tags: cantonese, Chinese, Cooking, dinner, easy, egg, food, fried rice, ham, how to make, ingredients, lovefoodies, quick, recipes | Permalink. I like these very much! Sticky Sweet Chinese Chicken Wings. Don’t forget, you can use this recipe for ribs, drumsticks and even fish! It’s so delicious, a must try! Categories: Asian Recipes, Chinese recipes, Main meals | Tags: cantonese, Cooking, easy, food, Hong Kong, how to make, ingredients, lovefoodies, oven, recipes | Permalink. Spice up your movie / football nights with some of these easy peasy Curry Puffs! They freeze real good too. (before cooking) and when you’re ready, 10 minutes in the oven and hey presto! Delicious! Always a real hit with the crowds! Categories: Chinese recipes, Holiday Treats, Pastry recipes, Sides | Tags: baking, cantonese, Chinese, Cooking, curry, easy, food, Hong Kong, how to make, ingredients, lovefoodies, pastry, puffs, recipes | Permalink.